Glin Castle is open for exclusive rental only for 2009. We welcome groups of 6 rooms or more. A rental includes the full and private use of all the castles reception rooms and bedrooms with a full compliment of staff. 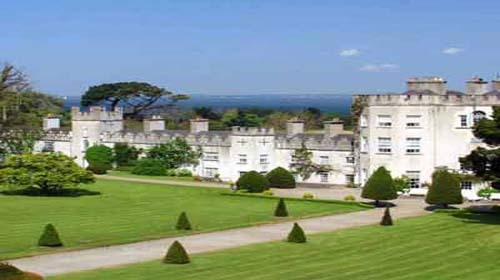 Glin Castle is perfect for small weddings, conferences, anniversaries and family reunions. 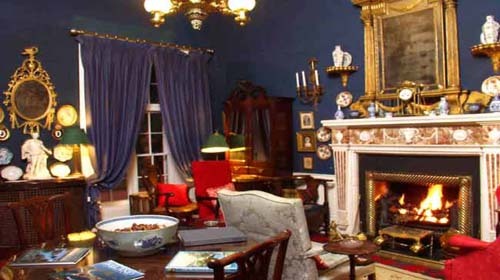 Glin Castle is a Member of Ireland’s BlueBook. The romantically-titled Knights of Glin, a branch of the great Norman family, the FitzGeralds or Geraldines, Earls of Desmond, were granted extensive lands in County Limerick in the early 14th century by their Desmond overlords. The Desmond family were all descended from the Norman Maurice FitzGerald, a companion-in-arms to Strongbow. Maurice was the son of Gerald of Windsor and his wife the Welsh Princess Nesta, Gerald having settled in Wales. She was famous for her many children including, among others, a son by King Henry I of England. As a result she became known as ‘the brood mare of the Normans’. This is the Castle Hall with its front door overlooking the River Shannon. The Reception Rooms consist of a sitting room (or Smoking Room) where one can sit and chat over a drink before or after dinner.The Library with its broken pedamented mahogany bookcase is situated below the rare flying staircase. Guests can relax in the splendid Drawing Room with its Rossi marble mantelpiece - elegant surroundings in which to have morning coffee, afternoon tea or to enjoy coffee and liqueurs. 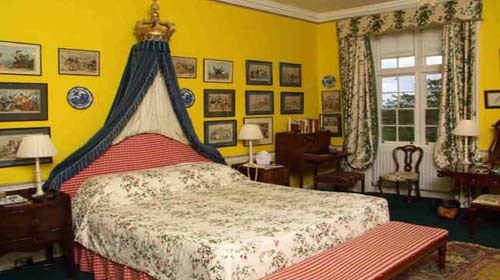 This is the Yellow Crown bedroom and its one of the four Deluxe bedrooms. It has both river and garden views. Each bedroom has its own unique bathroom. The castle has four Deluxe rooms, six Superior rooms and five Standard rooms. Superior and Standard rooms are situated in either the old Castle Wing or the third floor. All of the bedrooms and their bathrooms differ from each other in layout, style and decor. 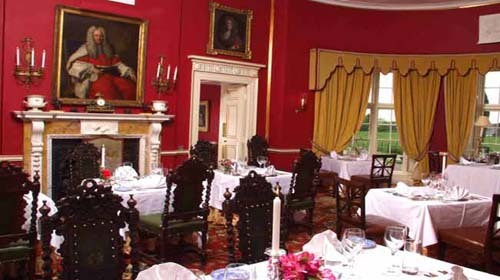 Glin Castle food is Irish country house cooking at its best. Dine off freshly caught fish and locally reared beef and lamb. Vegetables and fruit are grown in the castle’s organic walled garden. Sit down at a well laid table covered in crisp Irish Linen and family silver in the knightly splendour of the old dining room, with its rows of ancestral portraits. Our main dining room can accommodate a maximum of 30/35 persons. We also have a larger room that can cater for a maximum of 50 persons. For the wedding dinner, we can cater for a maximum of 50 persons. in which visiting gardeners can investigate and examine the flowers, plants and trees. The walled garden has fresh fruit and vegetables for the kitchen, and there are opportunities for walking, croquet and tennis. Glin Castle welcomes horticultural groups and societies. If you are planning a romantic, intimate wedding that is special and memorable in every way Glin Castle is the perfect destination. Overlooking the River Shannon and hills of County Clare it’s magnificent structure and grounds provides a uniquely picturesque setting for your celebrations. The castle from the luxurious interiors, four poster beds and log fires, to leisurely walks through the grounds and walled gardens is a romantic paradise. Old & New Courses 90 minutes including car ferry. Doonbeg: 70 minutes including car ferry. Limerick Art Gallery, Pery Square. The Georgian House, Pery Square. The Limerick Garden Trail comprises 9 unique and smaller gardens throughout Co Limerick. The town of Adare is reportedly Ireland’s prettiest village with it’s thatched cottages and historical features. Sights include several antique shops of which George Stackpoole, President of the Irish Antique Dealers Association, is the most noted. Michelina Stackpoole designs and sells ladies fashions. The Adare Manor Hotel which was once the home of the Earls of Dunraven. The Adare Heritage Centre. Adare Castle and Abbey. These activities can be arranged on site at the castle. Bunratty hosts medieval banquets and Irish nights. The castle has been restored and the folkpark depicts aspects of Irelands history. Traveling time. 1 hour.